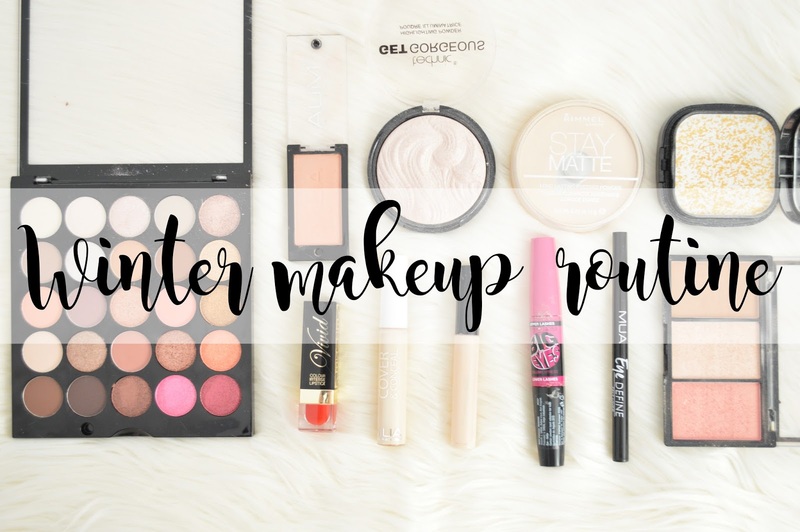 I am so excited to be sharing my Winter Makeup Routine with all of you, I know my Autumn Makeup had so much interest. I never used to bother really with my makeup, I'd wear the same products all of the time and even then, these product(s), there would literally be 4 or 5, I wore very little makeup as it never really interested me. As I've grown older I have absolutely loved finding new products and experimenting with different looks especially when it comes to my eyes. My eyes are definitely my favourite feature and I love for them to stand out! A lot of products I use on a daily basis are from Makeup Revolution, they are my favourite brand alongside Rimmel London and there's no doubt about this. Being a student, I also can't afford a lot either so this is a perfect brand for me! First things first, I always use concealer first on all of my blemishes and scars. I like to use the Collection Lasting Perfection Concealer in the lightest shade as I've found this is the only concealer I have tried which covers the majority of my scars and is the correct shade for my skin. I then use the MUA Cover and Conceal also in the lightest shade to cover my under eye circles. I recently purchased it and I have been loving it ever since. It's a similar coverage to the Collection concealer however it's a lot more brightening (which is why I cannot use it on my scars or blemishes). It does the perfect job to cover my dark circles! I set the concealer using my trusty Rimmel Stay Matte Powder in Transparent. I have used this since day one of wearing makeup and I'll probably never stop using it. It does the job, it makes my face matte, it sets my concealer and it lasts all day! The Makeup Revolution Sculpt and Contour Kit is another product which I use all year round for my contour. It's not orange at all and it's not too dark for my ridiculously pale skin either! I love how easy this is to blend! It's just an all rounder incredible product! This is another product which I have recently picked up and I have been loving wearing this throughout Winter! I really wanted a matte blush and MUA has the perfect selection of blushers in so many different shades of pink! This Mua Blush is in the shade "Lolly" and wow, it is pigmented! I'd say this is more pigmented than a Sleek blush and that is definitely saying something! It is beautiful! I also featured this product in my previous makeup routine and of course, it's the Technic Get Gorgeous Highlighter. This doesn't just look beautiful in it's packaging, but it looks beautiful once you have applied it too! Technic is such an affordable brand and the quality of their products are insane for the price! I have literally never loved a highlighter so much before. This is one of MUA's new products and it's the Burning Embers Palette. I fell in love with this and had to buy it over the Black Friday Period! These include matte and shimmers and all of the most wonderful shades which make blue eyes pop! This is my dream palette and I have been loving pink shimmery eyes recently with a touch of copper or gold! I haven't worn liquid eyeliner in a fair few years and I have wanted to get back into it throughout December so I picked up the MUA Eye Define Felt Liner at the same time. This felt liner is so precise and it makes it so easy to do the smallest line on top of your lash line, I have no idea where I have been without this. I was recently sent this Maybelline New York Falsies Big Eyes Mascara and oh my god, I love it! I switch between mascara's on a daily basis however this is always the one I tend to reach for. I use the other end to begin with which provides my lashes which heck loads of length and then I use the smaller end (the one shown) which picks up the tiny little lashes which a normal wand usually doesn't do. I also use the smaller end on my bottom lash line too. This is an incredible mascara and if you haven't tried it, then you need to! Lastly I apply some sort of lip product and I was recently sent the Nyx Liquid Suede Cream Lipstick in Cherry Skies - Deep Wine Red. I am in love with this! Not only is the consistency of this product beautiful and not too drying, but the colour is gorgeous and perfect for the Winter Period! This is the first NYX product I have ever tried and to be honest, I'm tempted to go and buy some more of their Liquid Suede's, they're gorgeous! Especially Sandstorm! What's your favourite go-to makeup product for Winter?